If you’re looking to make some changes to your smile or alter your tooth shape, size or color, porcelain veneers are a great option. Porcelain veneers are thin pieces of porcelain used to recreate the natural look of teeth. Veneers provide strength and resilience that is comparable to natural tooth enamel, making them a popular choice in cosmetic dentistry. Many celebrities have picture perfect “veneer” smiles, but each mouth is different so we’ll need to make sure veneers are the best option for you. We’ll start by carefully analyzing your smile to come up with a plan to achieve the look you desire. After your initial consultation, we’ll need to schedule a follow up appointment to prepare your teeth for porcelain veneers. You will leave this second appointment with a temporary set of composite veneers. A third appointment is necessary to cement the veneers in place. Veneers are made of several ceramic layers and an adhesive layer which bonds to your natural tooth. To apply veneers, a portion of your tooth enamel must be removed, creating room for the veneer to fit naturally over the surface. The end result is a beautiful, smooth surface that’s natural looking and can provide the bright, white smile you’re looking for. Porcelain veneers are a great choice for teeth that have developed poor color or shape – or for repairing gaps between teeth. 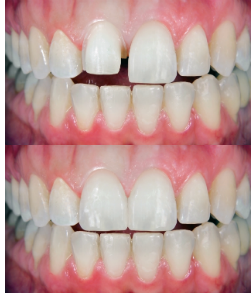 If you have had multiple bondings on your front teeth or decalcification which do not respond to whitening treatment, porcelain veneers are a good alternative.